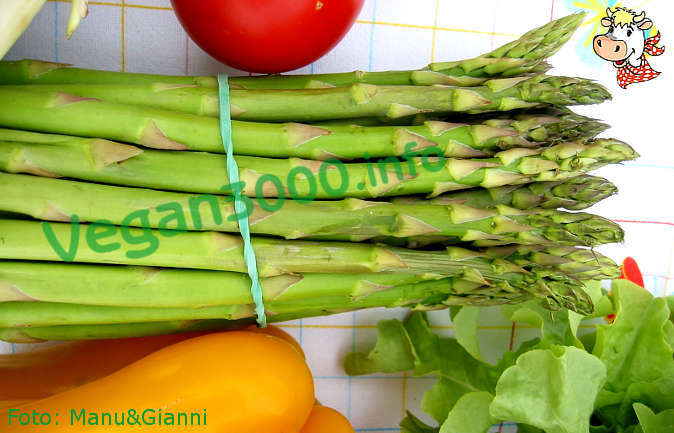 Peel the asparagus, raschiandoli and removing the woody part of the stems. Put to boil in lightly salted water. Trim the arugula and lettuce, wash several times and drain them well. Prepare the vinaigrette: trim the celery, also depriving him of any fibrous strands; scrape the carrots and peel the shallots. Reduce all three vegetables into cubes. Collect the oil into the blender jar, the strained juice of one lemon, a pinch of salt and pepper. Blend at maximum speed for 5 seconds, then add the leaves of a small bunch of parsley thoroughly peel, 4-5 blades of chives, half ladle of cold water and the diced vegetables. Restart the blender again for 3 seconds. Drain the asparagus, then pass them to drain on a cloth or on a double sheet of kitchen paper, then cut them into chunks, leaving tips whole. Arrange in a serving dish suitable together with arugula and lettuce. Dress the salad only at the time to bring it to the table and mix it in the presence of diners: collect any excess vinaigrette in a small bowl, it separately.